Each week, at-home critic Denise Purvis dons the guise of the Rental Reviewer and explores the best (and worst) of paranormal pop culture movies. This hit theaters in August 2009, and was released onto DVD Dec. 22. I watched it in the theater, but figured it was worth another whirl from the comfort of my own home – where I can wallow on my couch in my underwear (too much info? Nah). The film was directed by Neill Blomkamp and produced by Peter Jackson after funding fell through for the Halo movie based on the video game. It was just recently nominated for four Academy Awards, including Best Picture. descend to Earth and segregated into slums. Multinational United (MNU) is in charge of the movement of evicting the aliens to a new type of slum, District 10, with Wikus (Sharlto Copley, soon to be Howling Mad Murdock in The A-Team movie) playing the corporate schlub in charge of the evictions. While investigating an eviction site at District 9, he gets sprayed by an oily gunk that begins a nasty transformation and causes him to learn of the human mistreatment of prawns firsthand. The scene: Much of the film is shot in a gritty style, with “news” and documentary footage interspersed, so there are a lot of hand-held camera shots. Maybe I am a huge nerd (ya think? ), but I really like this style of film. 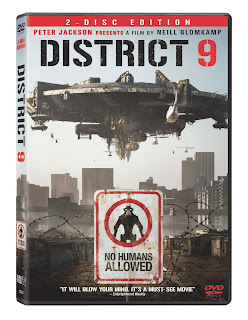 The take: There’s no doubt there are a lot of alien movies out there, but District 9 is especially notable. It has that whole political agenda behind it—forced evictions, segregation, “The Man” taking over, etc. It was a lot more emotional than I expected and the aliens didn’t look fake and cartoony. I highly recommend it. The extras: The DVD includes the documentary "The Alien Agenda: A Filmmaker's Log" and the special features "Metamorphosis: The Transformation of Wikus", "Innovation: Acting and Improvisation", "Conception and Design: Creating the World of District 9", and "Alien Generation: Visual Effects".